On January 23rd 2018 BDVA organises its 30th Activity Group with members in Brussels. During the day multiple plennary and parallel sessions will be organised covering the topics of Data Platforms, European Data Space (position paper), Big Data/AI in the Energy, Media, Smart Manufacturing, Telecom, Public adminstiraiotn and Agri-Food sectors, i-Spaces and Big Data Innovation Hubs and altorithm transparency. In the context of the European Big Data Value Forum 2018 in Vienna, the BDVA Smart Manufacturing Industry subgroup organized a workshop to debate on “Data-driven Collaborative Intelligence in Smart Manufacturing and Robotics”. On December 7th 2018, the European Commision presented a coordinated plan prepared with Members States to foster the development and use of AI in Europe. This plan, that delivers on the European AI Strategy adopted last April 2018, proposes joint actions in four areas: increasing investment, making more data available, fostering talent and ensuring trust. 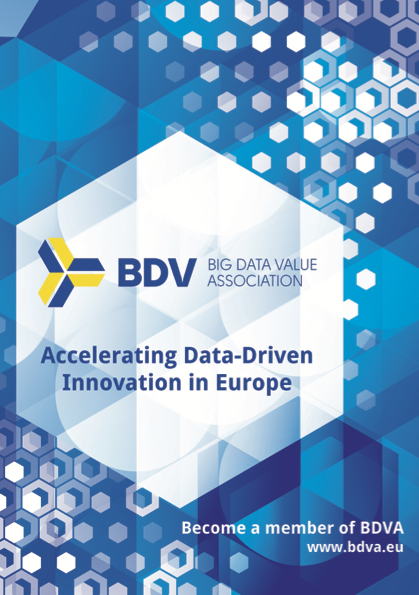 The European Commission and the Big Data Value Association (BDVA) organised last November 7th a Digital Innovation Hubs (DIH) Working Group meeting on Big Data and AI in Brussels. This meeting focused on exploring how Digital Innovation Hubs can help boost the uptake of this technology by SMEs and contribute to the European data economy. You can find out more about the outcomes of the meeting here. The European associations for Big Data Value (www.BDVA.eu) and HPC (www.ETP4HPC.eu) have recently published a joint paper, discussing current strengths and differences between the (software and hardware) stacks of BDC and HPC, and how the current strengths of one stack may address a shortcoming/need in the other stack. The Big Data Value Association held its General Assembly on November 14th 2018, in Vienna, in the context of the European Big Data Value Forum event. As part of the meeting, the BDVA members were called to elect over two-thirds of the members of its Board of Directors, and to elect a President and one Vice-President. The BDVA i-Spaces group organized, in the context of the European Big Data Value Forum 2018 (Vienna, 14th November) the workshop “Shaping the European Big Data landscape: from i-Spaces and Centres of Excellence to Big Data Digital Innovation Hubs”.